Window blinds are useful and decorative additions to your windows, but the dangled cords and dust-collecting slats are a hassle for homeowners. Built-in blinds aim to remedy the drawbacks of traditional blinds by keeping the window treatments sandwiched between two panes of glass. Built-in blinds are striking and functional options for window treatments, but their construction and location create problems that can be expensive and complicated to fix. Built-in blinds keep blinds in between panes of window glass. Built-in blinds are not a standard option for window treatment, and not all window or blind manufacturers offer the option. The limited availability means that built-in blinds tend to cost more than more standard window treatments such as exterior Venetian blinds or panel drapes. Instead of choosing from blinds in a store aisle, built-in blinds must typically be custom-ordered so that they are properly fit to your window size and in your specified color and design. Standard blinds are do-it-yourself when it comes to installation, but built-in blinds require the installation of an entire window. If you are building a home, choosing built-in blinds is relatively simple, but if you are replacing the blinds in your existing home, the entire window unit must be replaced with double-paned windows equipped to store built-in blinds. The installation requirement substantially increases the cost of the built-in blinds. Windows must be properly sealed to prevent heat loss and maintain high energy efficiency. Windows with built-in blinds are generally properly sealed when they are manufactured, but the heat-trapped properties of built-in blinds compromise the window seal. All double-paned windows trap air between the two pieces of glass; the addition of the blinds between the two panes reduces the ability of the heat to transfer through the glass. The hot air then expands in between the two panes, and the expansion causes the seal to weaken and reduce the energy efficiency of the window. Some windows with built-in blinds employ a third pane of glass to combat the heat loss, but the windows are much more expensive with the additional pane. One problem with standard blinds is that they are susceptible to damage, but they are relatively inexpensive and simple to replace and repair. 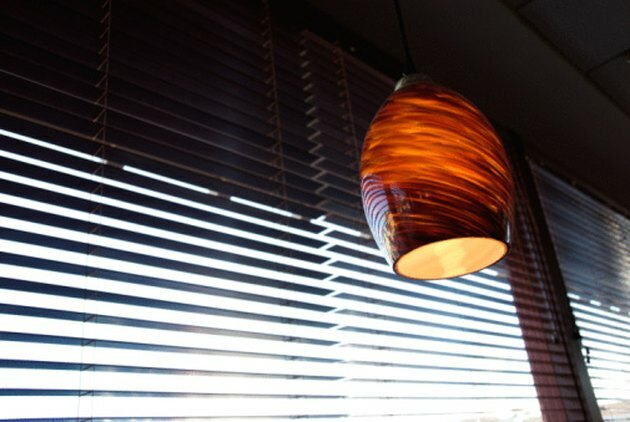 Built-in blinds are much less susceptible to damage, but in the event of a broken cord or bunched slats, repairs are more invasive, complicated and expensive.